This home is brand spanking new — not bland spanking new — with nods to local nautical culture. 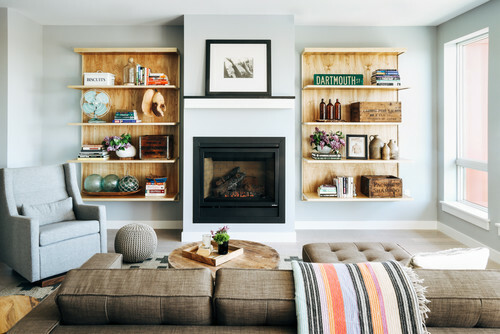 Before all the fixtures and finishes were selected for her new-construction condo in Portland, Maine, this busy homeowner knew she might be in over her head, so she turned to her gym buddy, interior designer Tyler Karu, for some expert advice. The two created a space that mixes industrial and modern, celebrates one-of-a-kind creations and embraces the local seaside culture. 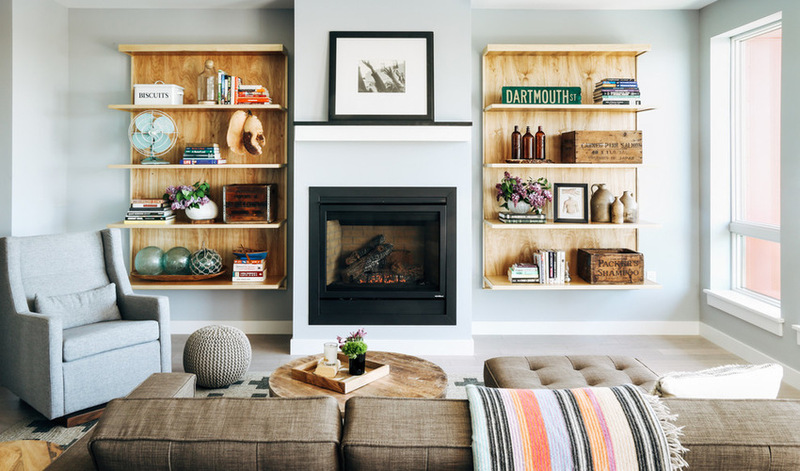 Karu says she and the homeowner gravitate toward a vintage vibe, so it was important to infuse the clean, modern lines of the new space with texture and character. 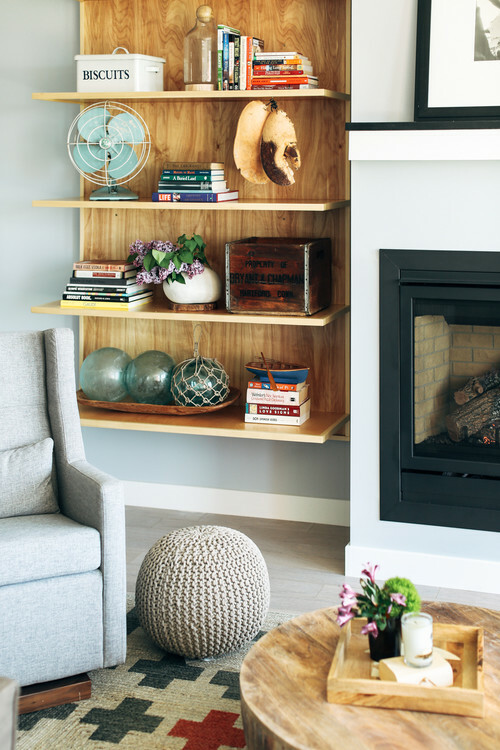 Custom shelving units on both sides of the fireplace were created by local craftsman Jamie Corcorcan. The backing of each unit consists of 4- by 6-foot birch sheets covered in polyurethane. The bookshelves hold a collection of books and accessories, many of which were bought at local flea markets. Two of the finds, the lobster claws and glass sea floats, reference nautical culture. The area rug is from CB2 and is a stylish and practical choice. 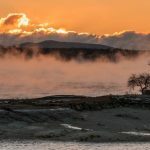 “Because of the homeowner’s dogs, we wanted a rug that could handle a little wear and tear and also be replaced if necessary without too much of an expense,” Karu says. 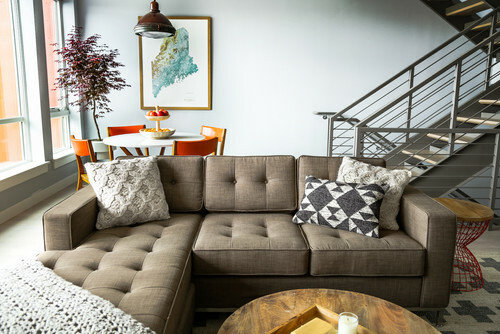 Crocheted pillows and a blanket, along with with a brown tweed sofa, were selected to add texture and warmth to the modern space. “The living area is a space that the homeowner and her dog like to plop down and relax, but it’s still a stylish spot for hosting guests,” Karu says. The dining area is at the base of the home’s stairwell and lends itself to a round table. Karu found the antique Danish wood table base through a vintage-furniture dealer and topped it with a 40-inch round piece of white quartz. The dining chairs, discovered at a flea market, have orange vinyl backs. 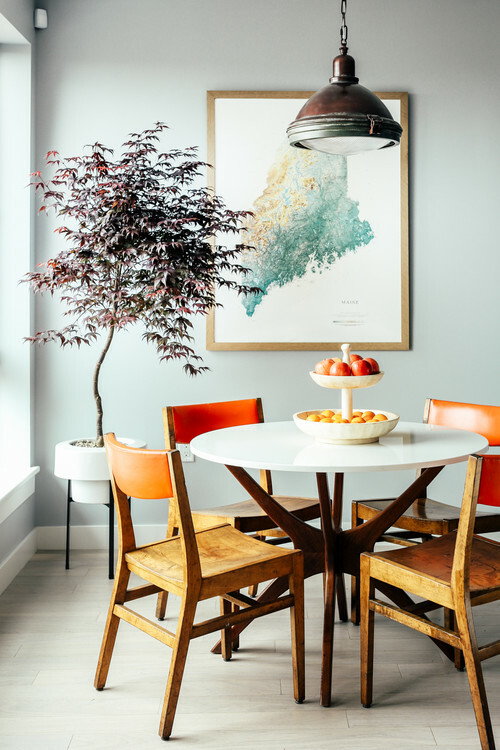 Other highlights of the space include a Japanese maple tree, a framed map of Maine and an industrial pendant light from Restoration Hardware. A wall at the end of the kitchen island was an ideal space for a statement piece. Corcorcan was once again used, this time to construct Karu’s design for an industrial pot rack. An assortment of pipes, joints, flanges and plumbing clamps makes up the custom rack, which holds a collection of Le Creuset pots and mugs. 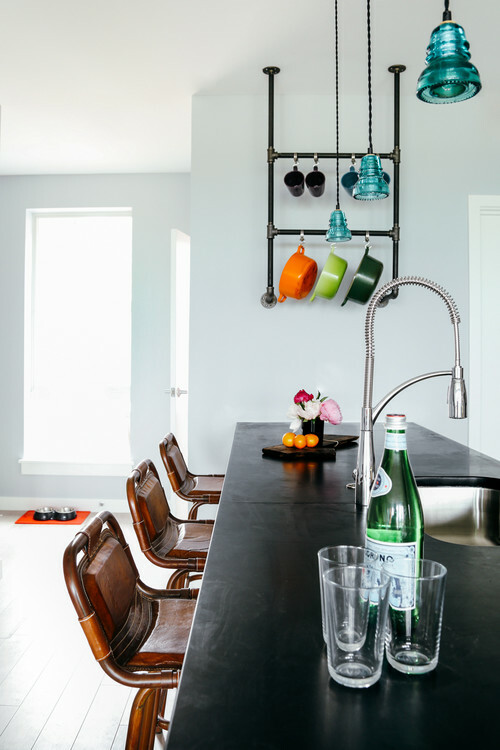 Honed black granite makes up the kitchen countertops, vintage electric insulators were used to create pendant lights, and rugged leather and metal stools complete the scene. The powder room was the perfect spot to add drama and have some fun. 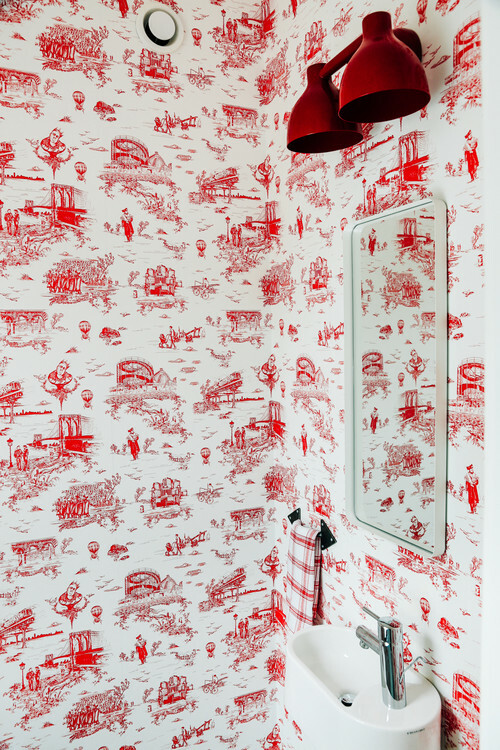 Several whimsical wallpapers were considered, but when the homeowner saw Flavor Paper’s modern take on vintage toile wallpaper, she found a winner. The pendant light above the mirror was powder coated in red. 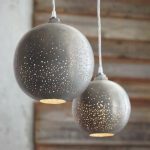 “This particular light is one of my favorites, because it’s relatively inexpensive and can easily be painted in a multitude of colors,” Karu says. The black lines of the four-poster bed add interest to the master bedroom. 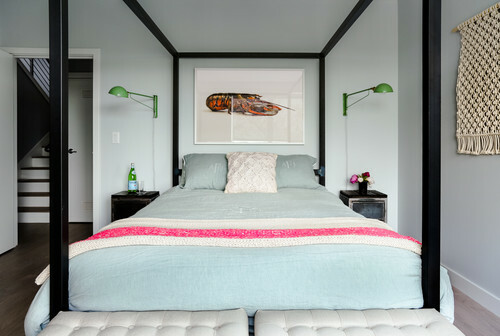 The space also has a framed photo of a lobster over the bed, salvaged pharmacy-style nightstands and green task pendant lights.